In 1525 the Grandmaster of the Teutonic Order, Albrecht II von Brandenburg, began the Reformation in Prussia and the Könisgberg bishop, Georg von Polentz, was the first German bishop to declare himself protestant. Albrecht II declared himself Duke of Prussia and began enlarging the castle. In 1544, he founded the city's university, the "Albertina". The city was already important as an exporter of amber although Tayside's imports from the area were more prosaic, flax, grain and timber. The warehouses storing goods on Königsberg's waterfront were a feature of Königsberg until their destruction in the Second World War. 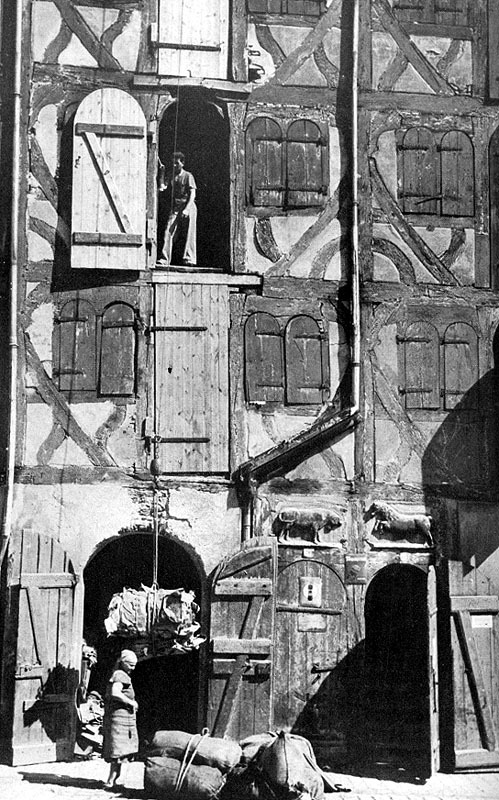 The oldest of these half-timbered buildings, and shown in the first photograph, called Hengst (Stallion) and Bulle (Bull) were built in 1589. The Compt Buik of David Wedderburn records Dundee merchant visiting Königsberg on 26 May 1596 and again (from the ledger of Andrew Halyburton) setting out on a voyage to the city on 24 May 1600. Search for voyages to Königsberg in the 16th century.